Top left is the New Year Chaser. This one was probably the most elaborate and complicated to make. It is a champagne cup on one end and a shot cup on the other. The double ended ball suspended in the middle "drops" when the cup is turned over, almost touching the point of the bottom cup but swinging clear. The "bubble" cup on the right was one of the first ones from the "beach party series". I liked the idea of it looking like there is no bottom yet it holds a full once. 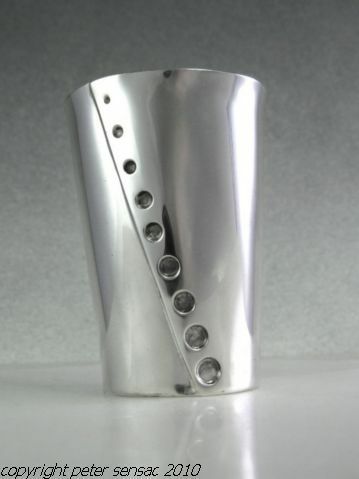 The Tornado cup and the Conch cup are some of the early designs. The tornado cup has gold balls swirling around the out side. This one proved to be difficult because it's one long piece of wire and that is one long solder joint to go top to bottom without any gaps or leaks and then soldering on the gold balls without re-flowing the whole thing was a challenge too. On the right of the Tornado Cup is the Conch Cup. Sea shells an sea life have always fascinated me (as you can tell by my website) This one is self explanatory but again, some tricky solder joins. On of the most difficult things cannot even be seen in this shot. The feet are tiny silver spirals that had to be soldered on near the end. Let's just say it's hard to solder something small to something big. This bubble cup on the left was done for the 4th of July. 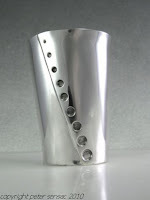 Again using the drilled out metal as a decorative design element. I have used this technique on several jewelry pieces over the years. On the right is a wedding cup done for a friend. They wanted lots of texture. I like the little feet on this one. I have done 3 others with this type of foot. I used this "box making" technique to go a step further by making a lid and drilling through the sides make a tea ball. I wrote a blog post on that one here. 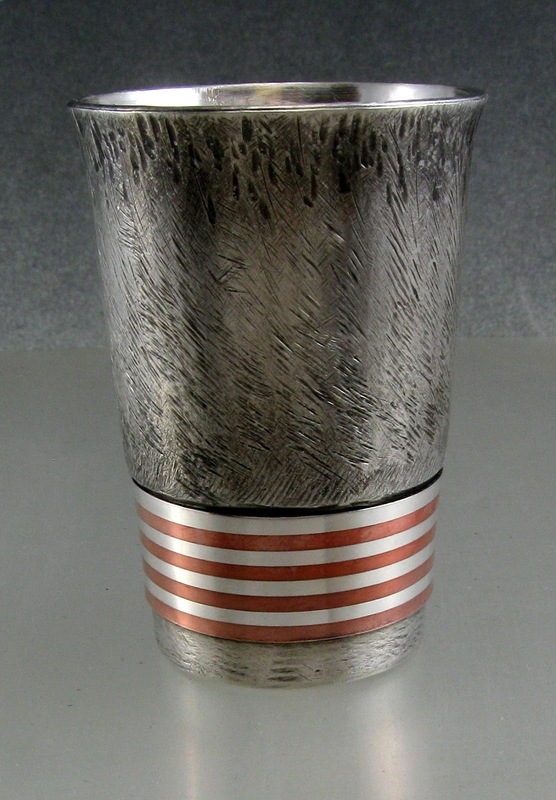 I used a course rasp file to get the texture on the out side and soldered on the copper and silver stripes cut from long strips of this material I made years ago for earrings and bracelet. That in it self is a good blog post. Its a pretty involved process of soldering and rolling. These 2 were done for the fun of it but have been sold. making" technique to go a step further and make a tea ball. I wrote a blog post on that one here.